More Flop than Flip. Sony's unique take on the convertible concept has produced a very nice-looking series of Flip notebooks to compete in the notebook-tablet hybrid space. The Flip 14 is eye candy for sure, but there is more than meets the eye.. and it's not all pretty. 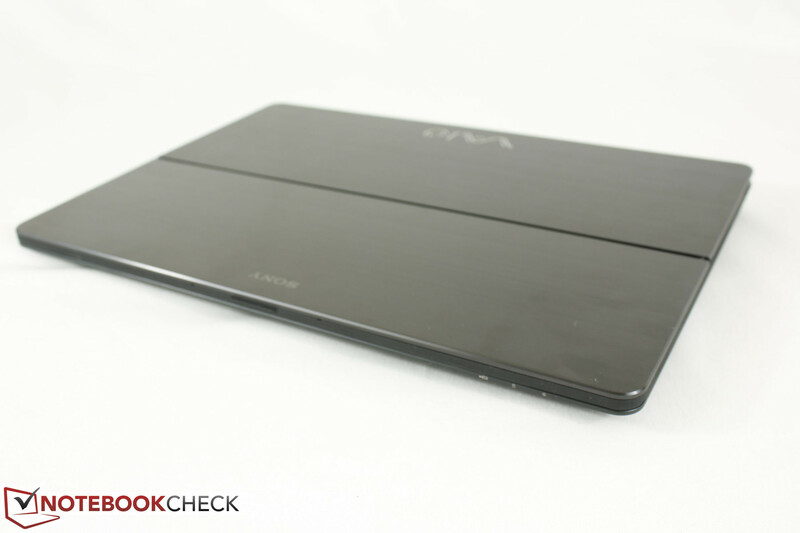 Over the past six months, we have reviewed nearly the entire Flip series of Sony notebooks - The Vaio Flip 11, Flip 13, and Flip 15 - and we came out impressed by the series' trademark flip display and stylish design. With the Flip 14A now in our hands, we can complete the roundup of Flip models before Sony closes the curtains on the Vaio brand for good. In fact, many of these notebooks are no longer available directly from Sony's online store, but are still on sale in certain outlets. The Flip 14A in review shares many hardware features with its family members as expected, including the brushed aluminum chassis to the glass edge-to-edge touchscreen. There are some key differences, however, such as the 1080p display and single-channel memory compared to the WQHD (2440 x 1620) resolution screen and dual-channel memory of the larger 15.5-inch model. 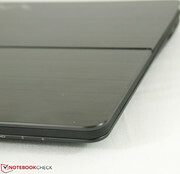 This puts the 14-inch Flip more in line with its smaller 11-inch and 13-inch siblings rather than its bigger brother. Upon first impression, the Flip 14 certainly stands out from the crowd of convertibles with its sharp edges, flat faces, and very reflective brushed aluminum lid. 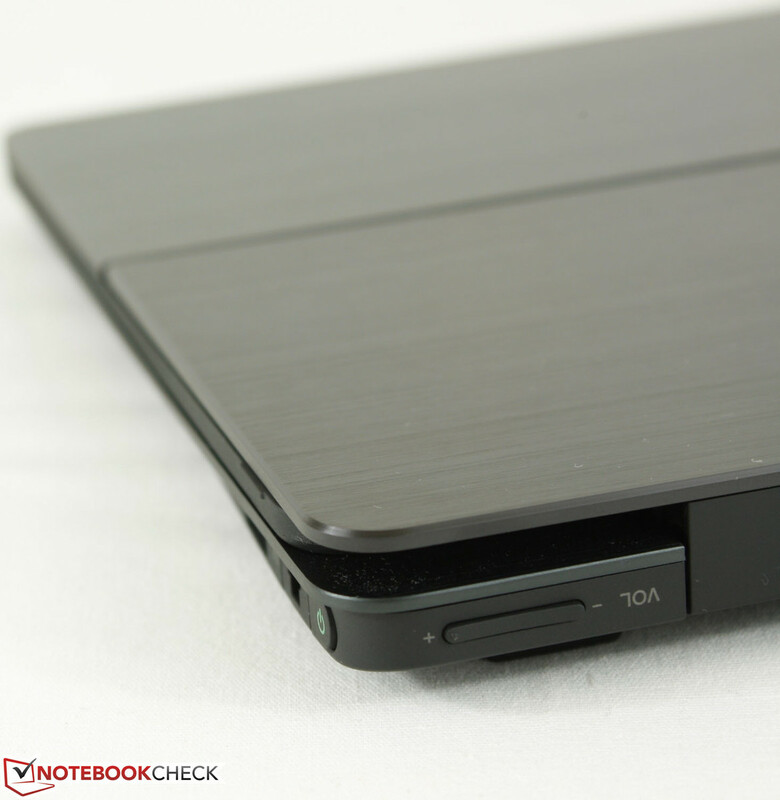 In particular, the bisecting line across the longitude of the lid separates the Vaio from other notebooks visually and is what enables the display to flip into different modes. 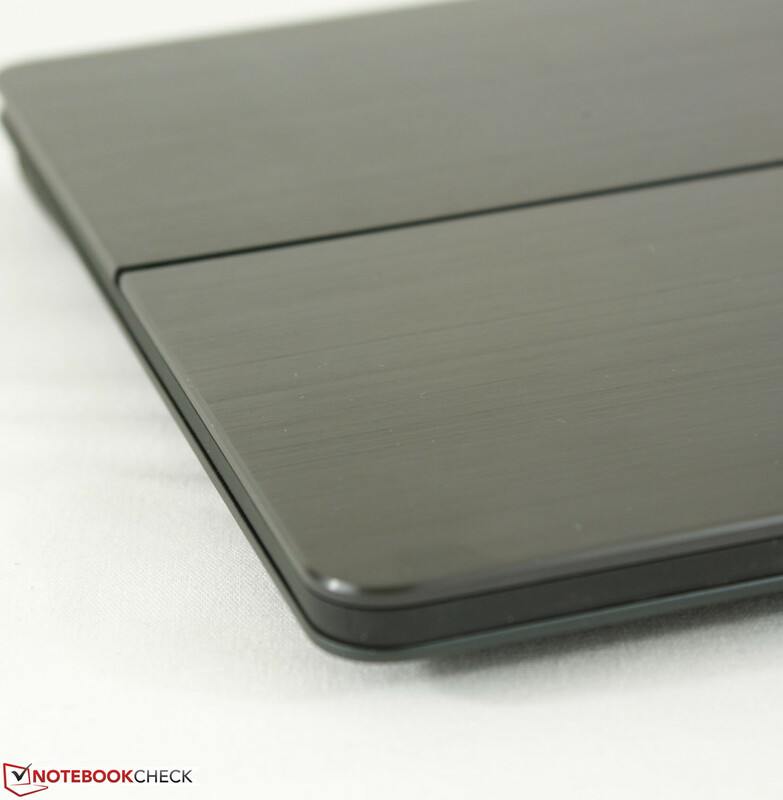 The shiny outer surface extends beyond the lid and onto the palm rests while the rest of the base of the notebook is matte all-around, including the slightly rough-textured touchpad and belly of the unit. 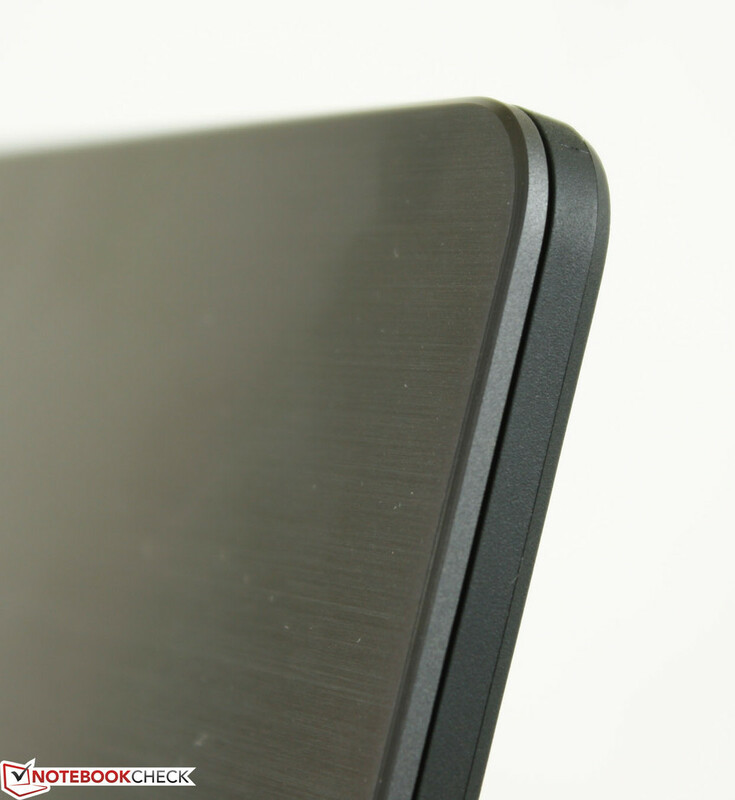 Meanwhile, the edges and corners of the display are rubberized for a rather high-quality feel. The mixture of textures and surfaces of the Flip models blend together very well to make them arguably more visually appealing than the competition and certainly well representative of the $900 price point of the Flip 14. Past these initial impressions, however, and we begin to see some weaknesses in the case. Sony products have traditionally been stylish, but the build quality of the hardware can fall short in comparison. This isn't to say that quality is subpar, but we found the plastic surface surrounding the keyboard keys of the Flip 14 to feel thin and cheap compared to the brushed metal lid and palm rests. 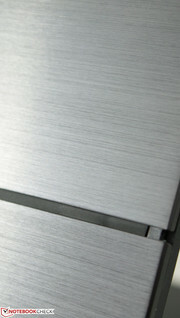 The hinge could have been better, too, as the screen can wobble slightly during use. The front corners are also susceptible to some twisting and the outer lid equally susceptible to warping with applied pressure down the center. Perhaps surprisingly, the lid is very resistant to side-to-side twisting as its extra thickness to support the flipping mechanism makes it more firm compared to other notebooks that have much thinner displays. As for the actual flipping process, we find the procedure to be less ergonomic than other convertibles. 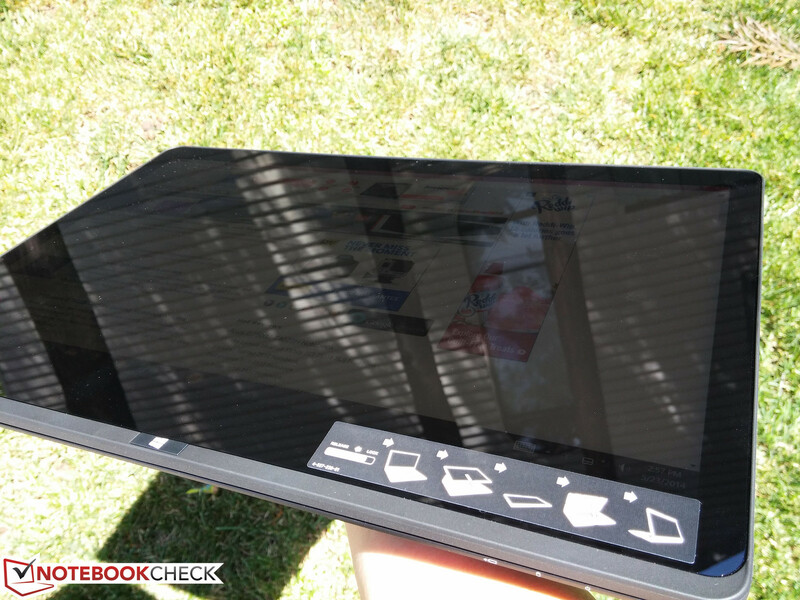 Switching to tablet mode is quick, but switching back to notebook mode requires a bit more time and movement compared to simply rotating around a pivot or axis a la the Lenovo Yoga, Lenovo Twist or Asus Tachi 31; It certainly takes a bit more practice in comparison. Another minor complaint is that users must remember to keep the switch in 'Lock' mode if using the notebook in the traditional manner. Otherwise, the user may inadvertently flip the screen during use. The overall weight of the Flip 14 Ultrabook (1.96 kg) is heavier than the similarly sized Flex 14 (1.85 kg) and even the ThinkPad T440 (1.70 kg) and HP Zbook 14 workstation (1.78 kg), but that is the price to pay to pay for most convertibles when compared to standard one-trick Ultrabooks. 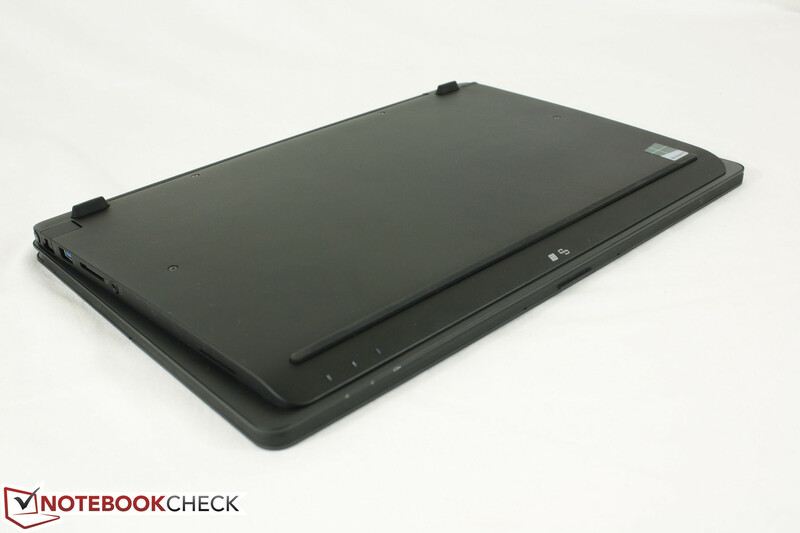 The somewhat hefty Vaio will still work as a travel companion, although its extra girth and weight as a tablet is best used on the couch or airplane as it can feel a bit too heavy otherwise. 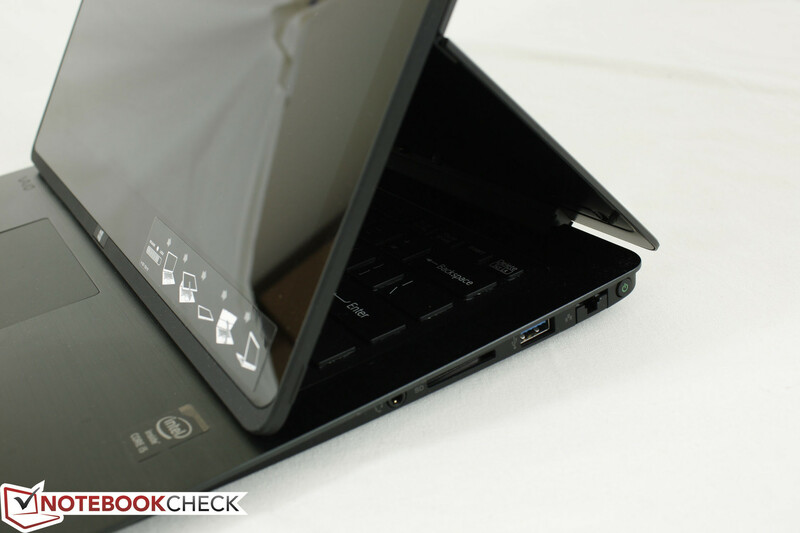 Compared to detachables like the HP Split x2 or Asus Transformer Books, this is a key disadvantage of the flipping mechanism. 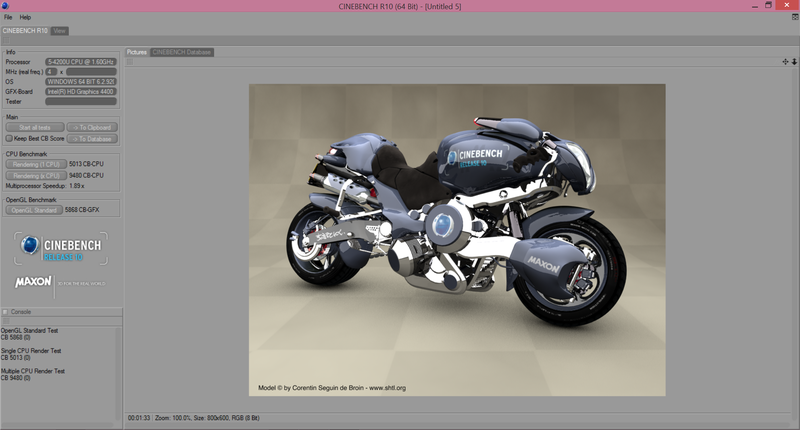 Benchmark Comparison Plugin: ERROR, Layout "0" not supported! As an Ultrabook with limited surface area, available connections include all the core basics and not much else. In fact, the ports of the Flip 14 are exactly the same as what the Flip 15 offers. 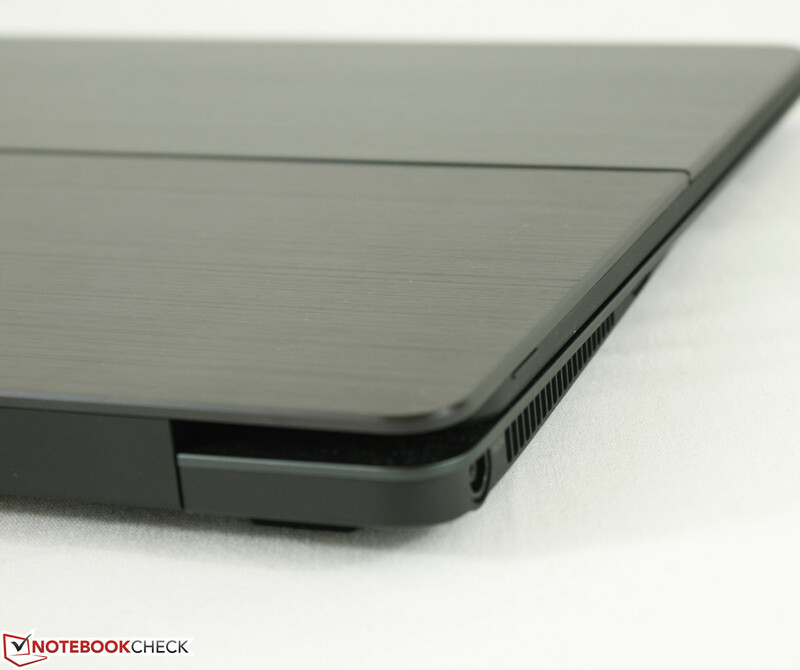 The two USB 3.0 ports (one sleep-and-charge) are standard amongst Ultrabooks this size, though the Flex 14 notably includes three USB ports total. Nonetheless, the ports here are all easy to reach and far away enough from the front to not entangle mice and valuable table space. The standard 802.11 a/b/g/n is provided by a dual-band (2x2) Intel wireless 7260 half mini PCIe card with Bluetooth 4.0. 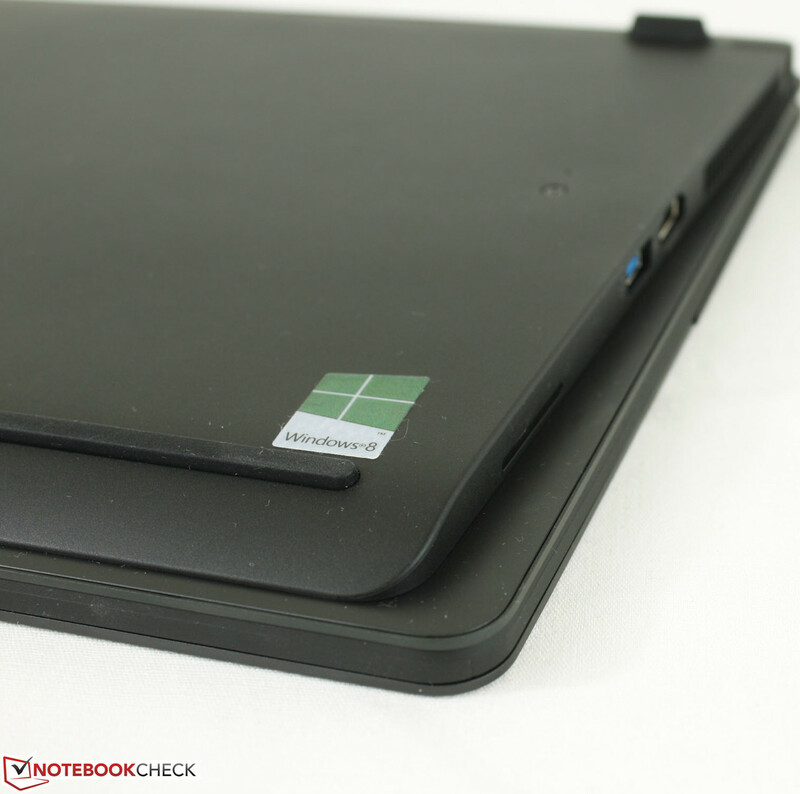 The manufacturer does not include GPS options as is common with most Ultrabooks. Even so, we would have liked to see WWAN options to further justify the price point and to separate the Flip 14 from its competitors. Dedicated docking stations and secondary batteries are a rarity in this category, so the Flip 14 is limited to generic carrying bags and sleeves. 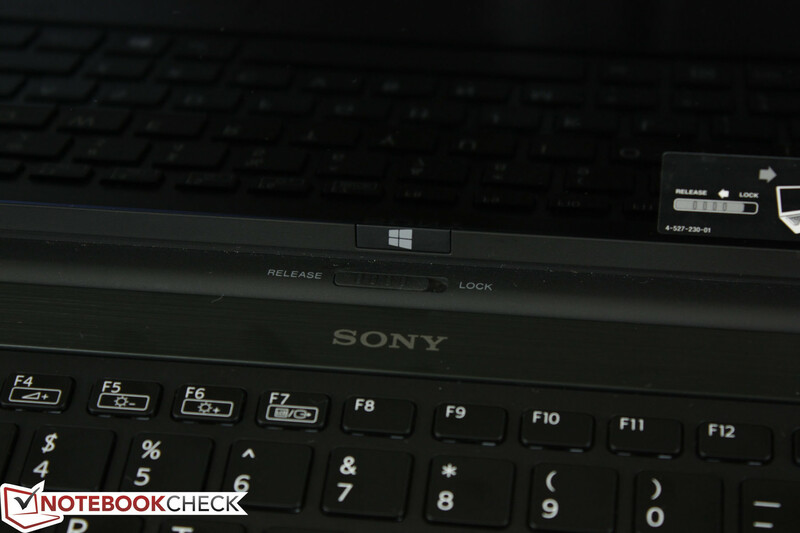 Sony sells official gear for the Vaio lineup, but many items are currently out of stock as the manufacturer prepares to exit the notebook business. 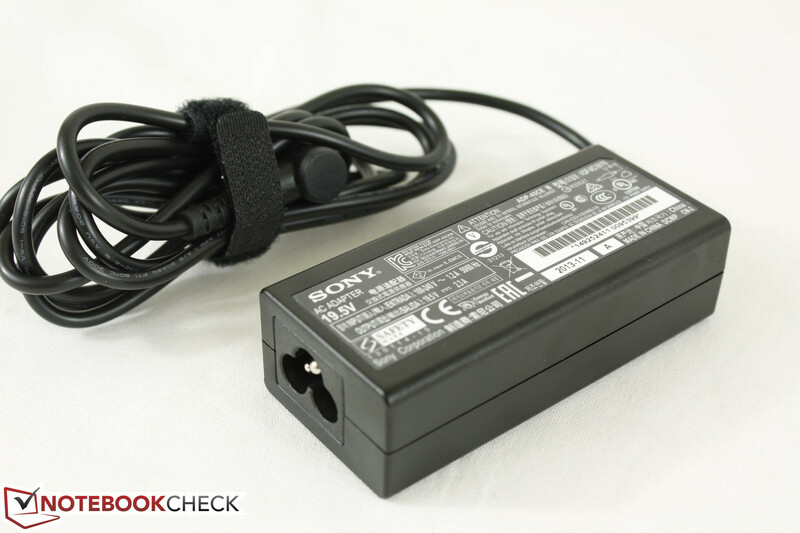 Sony offers the standard one-year limited warranty that covers certain defects and damages. Of course, it wouldn't be far-fetched to purchase additional coverage from a separate entity, such as brick-and-mortar store, for the same reason above. Perhaps coincidentally, Sony's own official warranty information PDF page is currently down at the time of publishing. The backlit Chiclet keyboard (28.5 x 10.5 cm) is predictably similar to other Flip models, which we found to be average at best. The keys themselves are smooth plastic that will highlight even the most minor fingerprints. 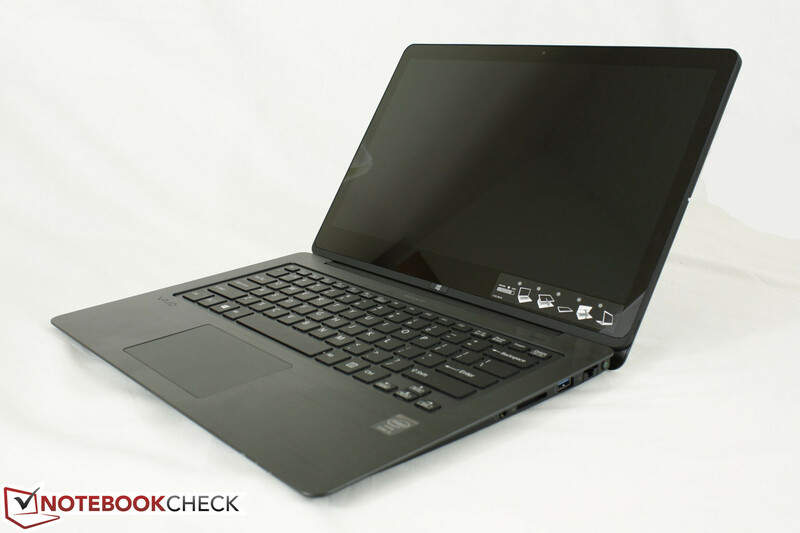 Furthermore, they offer weak feedback when pressed with shallow travel, though the latter is a common characteristic amongst Ultrabooks. What we can't excuse, however, is the mushy feeling of many of the keys including the Space bar, Function keys, Enter key, and Arrow keys. 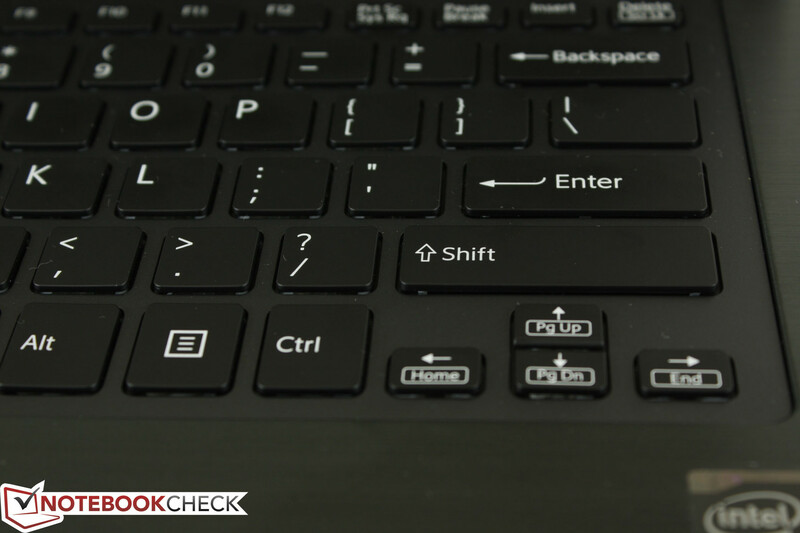 Users will likely become accustomed to the keyboard after regular use as with any other notebook, but the keyboard here has plenty of room for improvement. 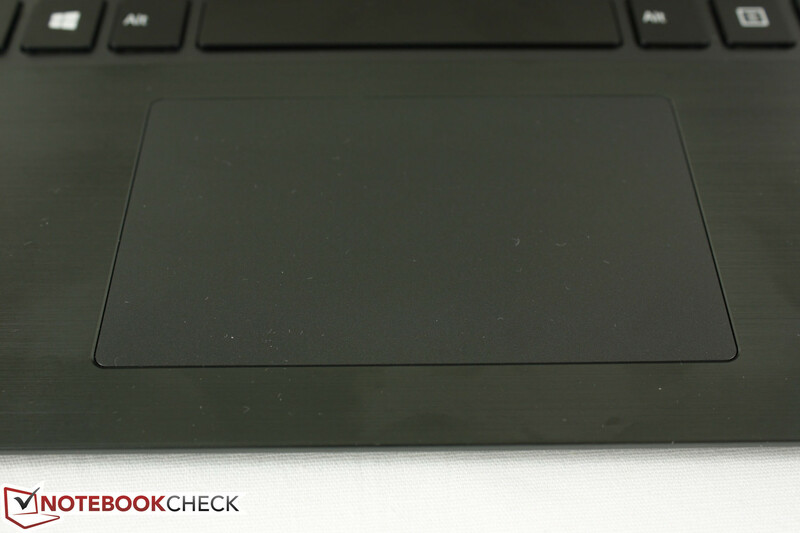 The relatively large (10.5 x 6.5 cm) matte touchpad works well in terms of simple navigation, multi-touch gestures, and scrolling. 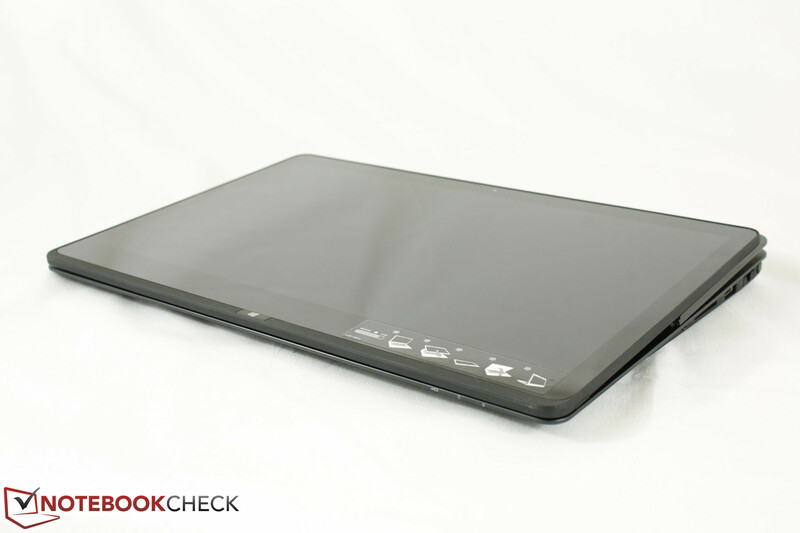 The Synaptics ClickPad V1.0 software allows for customization of up to three-finger gestures. Unfortunately, the touchpad is picky about where it will register a click. Tapping the surface will not always result in an input and pushing down on the pad to click only provides a soft and unsatisfying feedback. In particular, the touchpad is less sensitive to taps around the edges and corners compared to its center. This makes clicking a bit less reliable if a USB mouse is unavailable. Compared to the unimpressive keyboard and touchpad, the multi-touch touchscreen is as responsive as one would expect from a tablet and registers our inputs with little error. It may not be the most productive use of a notebook, but the multiple modes of the Flip 14 make it a fun distraction. The Flip 14 uses a Full HD IPS edge-to-edge glass display that is now standard amongst touchscreen convertibles in this price range. The glossy surface certainly contributes to the high quality looks of the screen, though we do wish there was a matte option similar to the inner display of the Taichi 31. For resolutions beyond 1080p, users will need to go one step up to the 15.5-inch Vaio Flip 15 for an even more impressive resolution of 2880 x 1620 pixels. 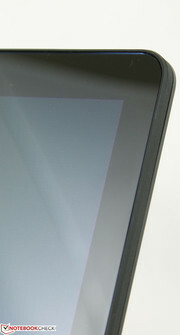 However, we found the screen size and resolution of the Flip 14 to be just fine for videos and day-to-day web browsing. Too high of a resolution may have made certain touchscreen actions more difficult as onscreen icons become smaller. 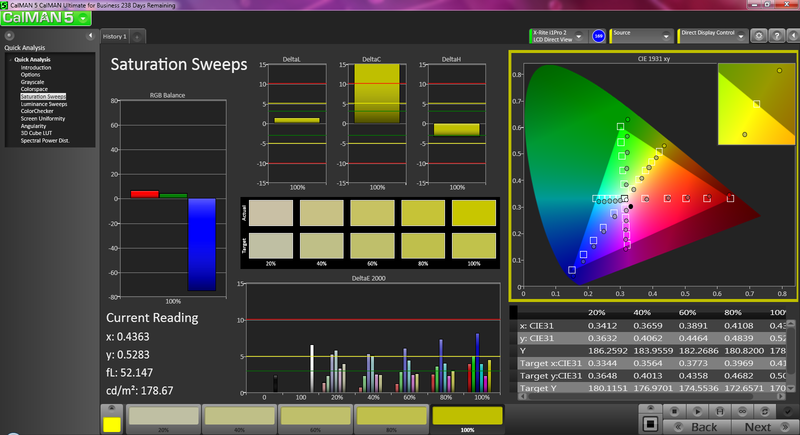 We measure an average brightness of 330 nits across the screen, which is brighter than the Flex 14 and both displays of the Taichi 31, but slightly below the screens of the Flip 15 and Flip 13. 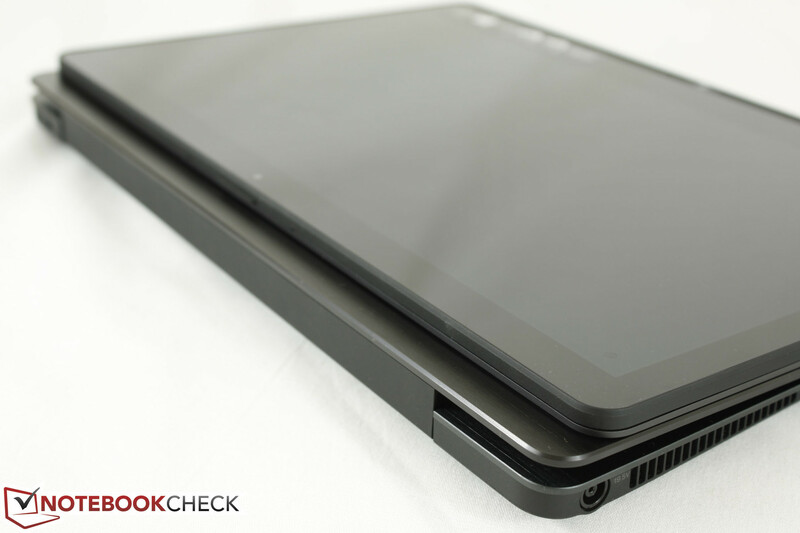 The ThinkPad Yoga and Flip 11 have brighter screens as well, partly due to their much smaller screen sizes. Even so, we are a bit disappointed by the less than 500:1 contrast of the Flip 14 when all of its siblings and immediate competition have notably higher contrast levels. The Flex 14 is an exception with a lowly ~300:1 contrast from its budget 720p TN display. 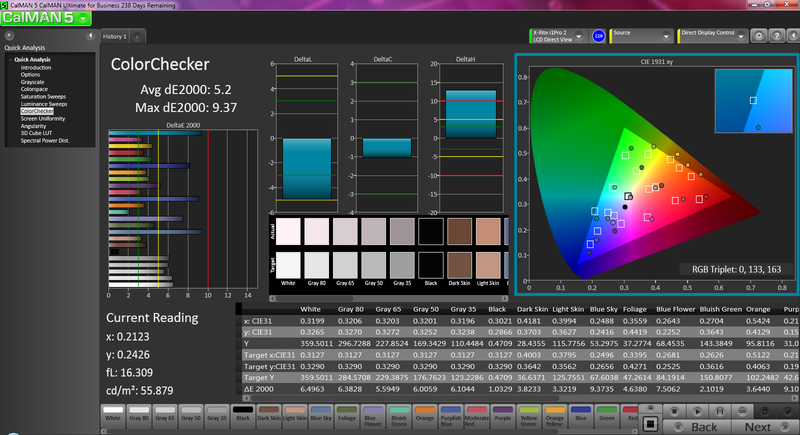 The Flip 14 enjoys a wider color reproduction range compared to budget TN panels that typically cover only around 60 percent of the sRGB spectrum, such as the one found on the Flex 14. At a high 86 percent of the sRGB standard, colors appear vibrant on the Flip 14 despite the average contrast. 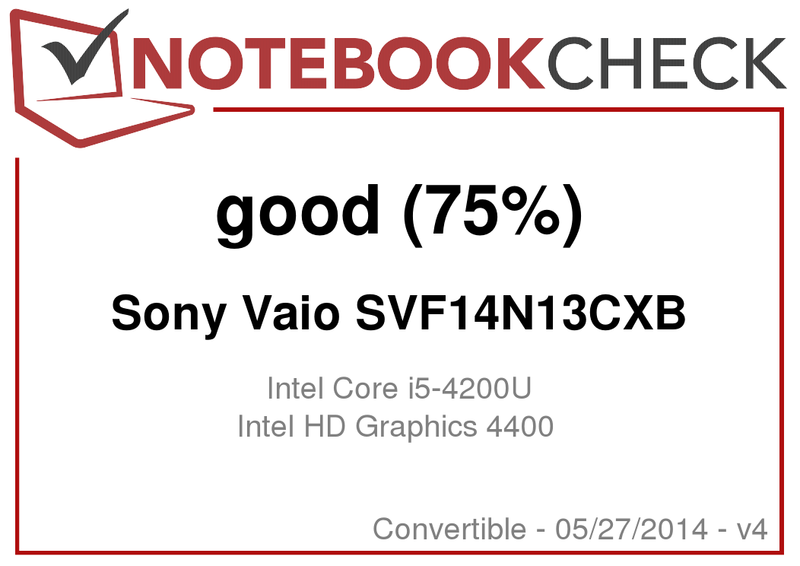 The Vaio is still a consumer-oriented device, however, so it covers only about 64 percent of the more demanding AdobeRGB spectrum. As such, the notebook is not fit for professional graphics work, but is more than sufficient for general home use and media playback. 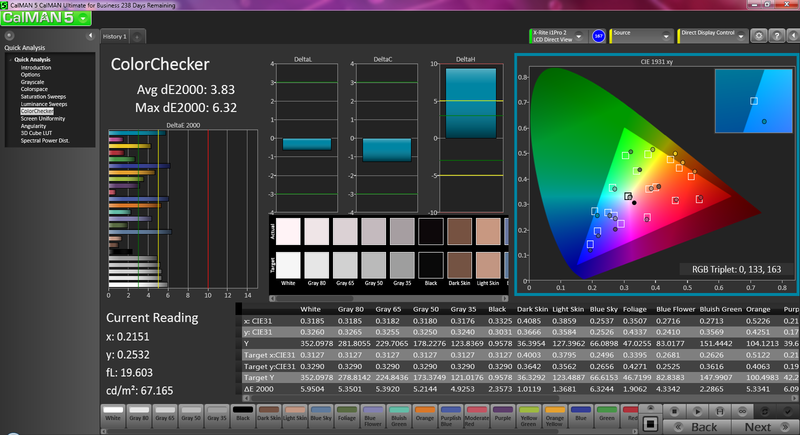 Further display measurements with an X-Rite i1Basic Pro 2 spectrophotometer reveals very good color accuracy even out-of-the-box. Grayscale and saturation levels are fairly consistent while blue tones are comparatively more inaccurate. However, this may just be due to the cool 6000K color temperature of the display contributing to the higher DeltaE 2000 deviations. 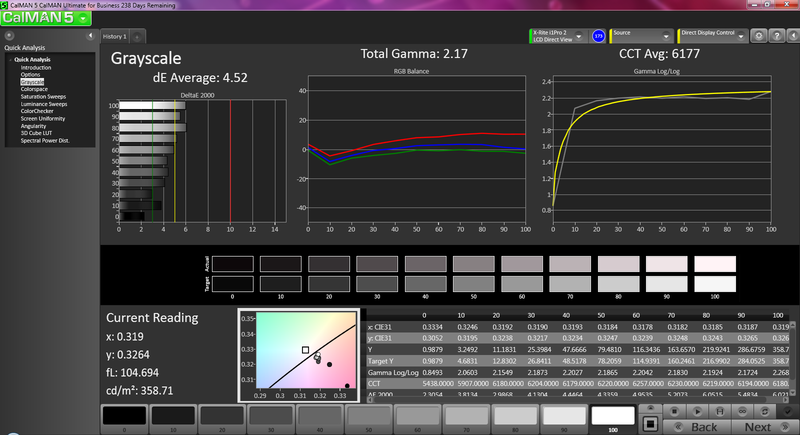 A quick calibration reduces the deviation and flattens the RGB balance to be closer to the approximate 2.2 gamma as defined by the sRGB standard. 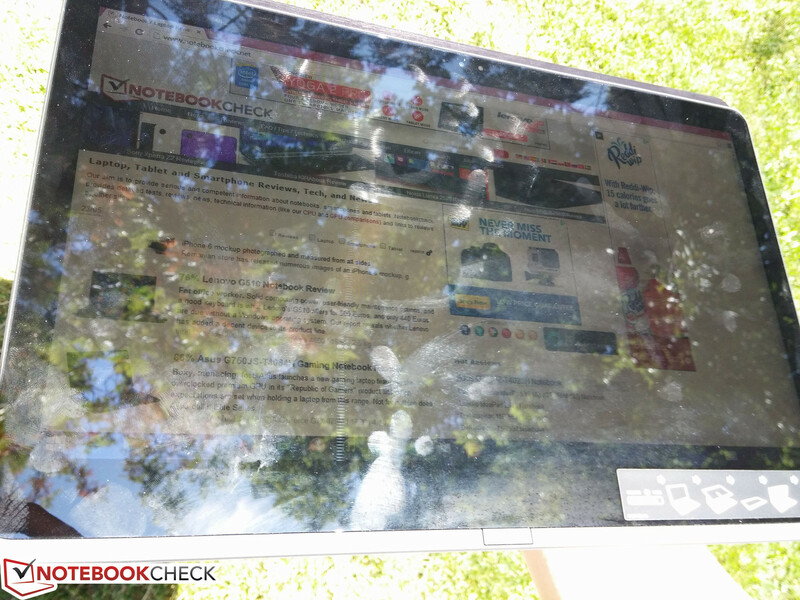 Outdoor usability is difficult due to two major factors: a glossy screen and a reduced maximum brightness when running on batteries. 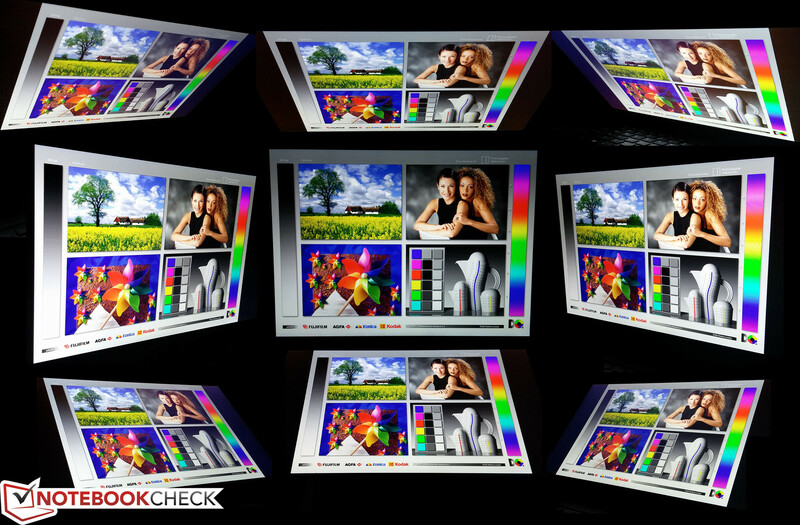 A reflective screen can usually be overcome by a strong backlight, but maximum brightness drops to under 300 nits on batteries. While more than sufficient for indoor use, direct sunlight and glare make visibility difficult on the Flip 14 regardless of the brightness setting. 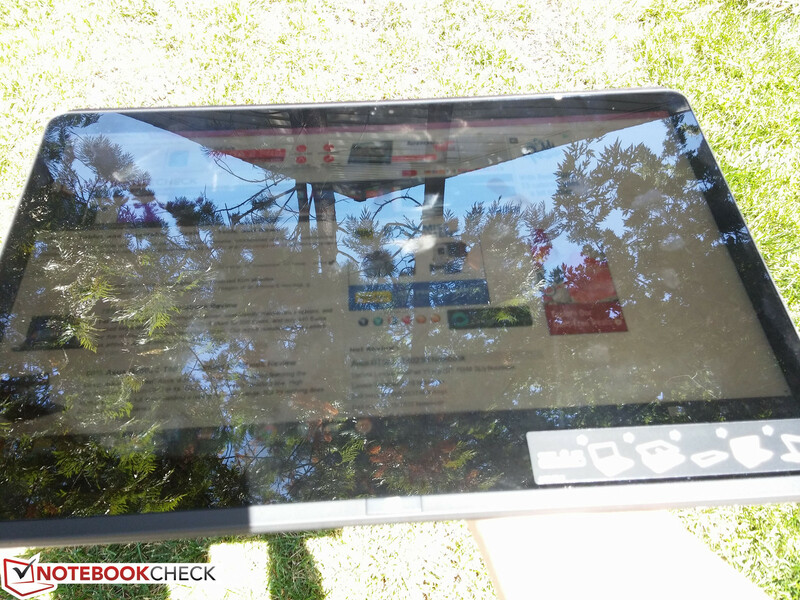 We recommend working under shade and with a clean screen free from fingerprints to improve outdoor usability as much as possible. Viewing angle stability is typical of an IPS panel with wide viewing angles from all sides. Note that apparent brightness will drop noticeably if viewing from above or below the normal, so using the Flip 14 in tablet mode while on the landscape orientation can make it a bit difficult to view for nearby friends. This becomes more obvious when outdoors where glare can become increasingly bothersome. Otherwise, color degradation is almost non-existent. 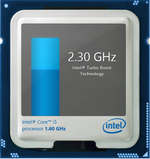 The i5-4200U is a common ULV CPU found in many Ultrabooks and some Windows tablets including the Surface Pro 2. 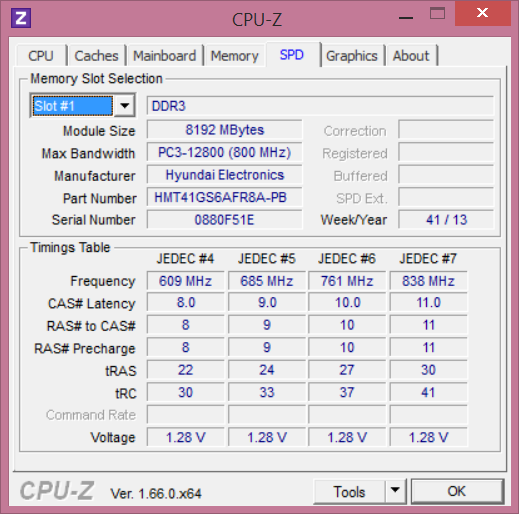 It is rated for a base clock of 1.6 GHz with support for Turbo Boost up to 2.6 GHz for a single core, but will reduce to 800 MHz if on the Power Saver profile. Likewise, the integrated HD 4400 GPU is rated for up to 1000 MHz and will clock down to reduce power and temperature as needed. 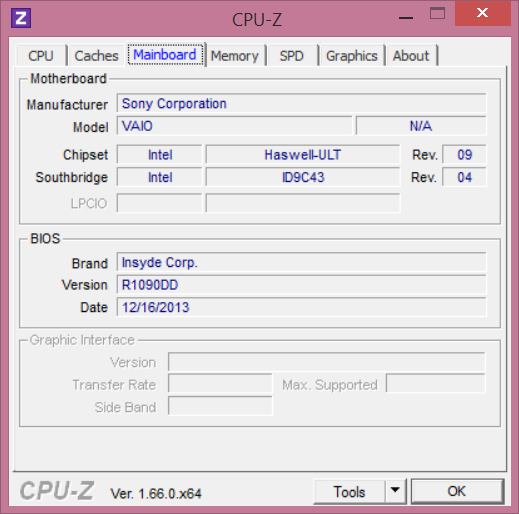 Sony offers no other CPU options as of this writing for the Flip 14, though it should be more than sufficient for everyday tasks and browsing. 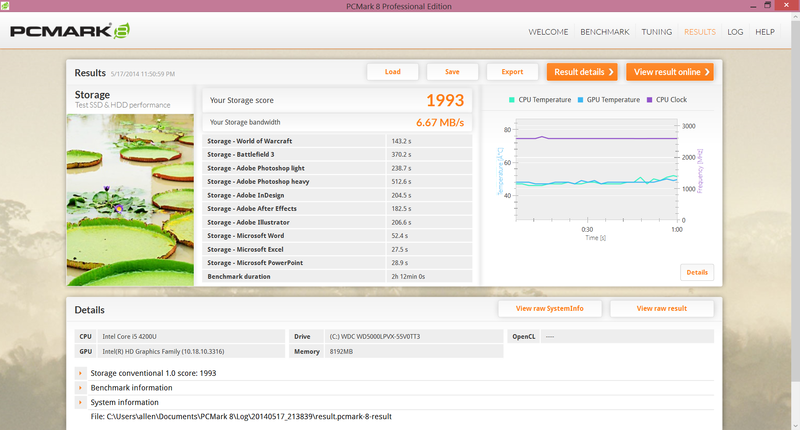 More information and benchmarks on the Haswell processor can be found in our dedicated CPU page here. The panel underneath can be removed to expose the HDD, non-removable battery, system fan, WLAN card, and the single SODIMM slot. The cover can be difficult to pry open, however, even after loosening all the Philips screws hidden underneath the rubber footing. RAM is single-channel only and is provided by one 8 GB PC3L-12800 module in our test model. Don't expect to upgrade anytime soon either as the hardware supports only a maximum of 8 GB. 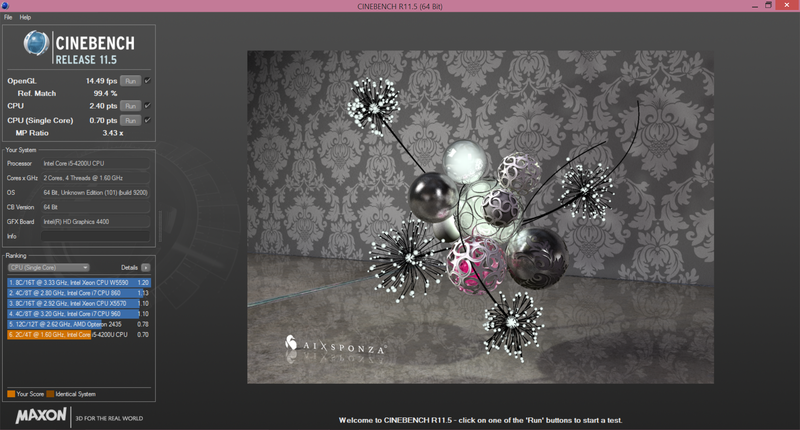 CPU performance is similar to other notebooks sporting the same i5-4200U processor, at least according to CineBench multi-core scores. The CineBench R15 Multi score of the Flip 14 (222 points) is pretty much the same as the similarly-equipped ATIV Book 9 Plus (231 points) and ThinkPad T440 (224 points), but the single CPU score of 44 points is less than half of the Pavilion 15 (102 points) and Flip 13A (101 points). 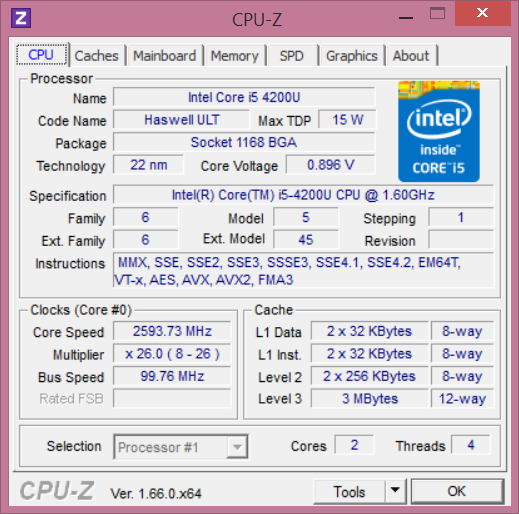 Conversely, the single-core SuperPi and multi-core wPrime benchmarks show results in line with other systems sporting an i5-4200U. The large differences may be explained by the throttling issues as detailed in the Stress Test section below while running the CineBench benchmarks. 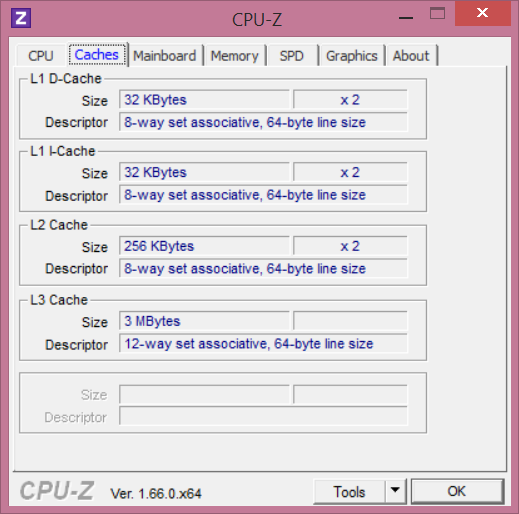 Overall performance is roughly comparable to the previous generation ULV dual-core i5-3337U or a quad-core AMD A4-5000 Kabini APU in multi-core applications. 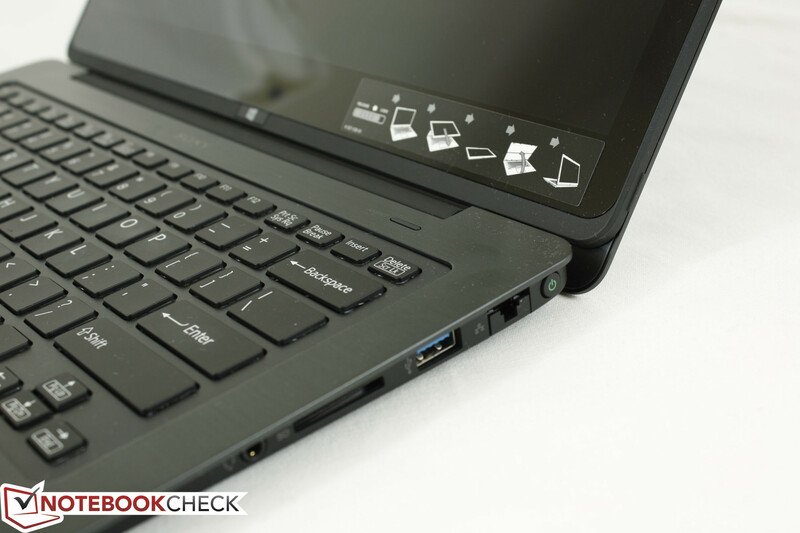 The final PCMark 7 score of 1594 points is very poor and is similar to low-end budget notebooks like the Satellite C50 (1621 points), HP 250 G2 (1604 points), and the Aspire E1-510P (1595 points). It' is worth noting that these examples all sport much weaker Atom processors with slow Bay Trail HD Graphics and mechanical HDDs while costing much less than the Flip 14. In comparison, the Samsung ATIV Book 9 Plus with the same Haswell CPU but with an SSD scores 4912 points, while the ThinkPad T440s with the same CPU and a better 7200 RPM HDD scores 2287 points. 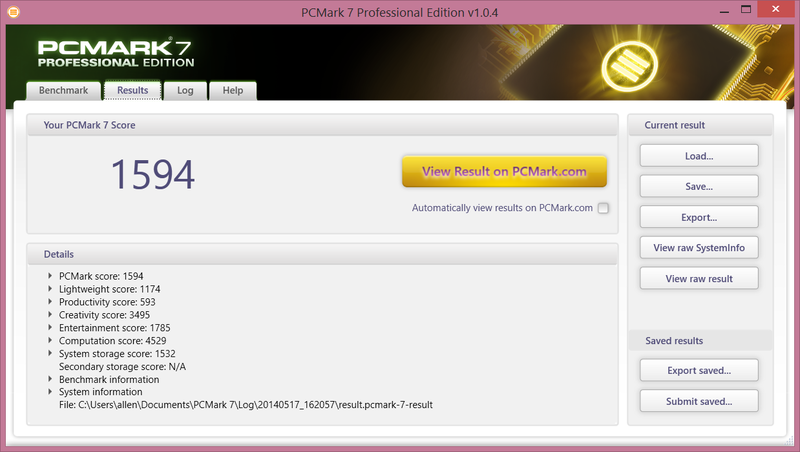 PCMark 8 scores show a similar story as well with many notebooks sporting the same CPU running laps over the Sony. In either case, the Flip 14 does not compare. 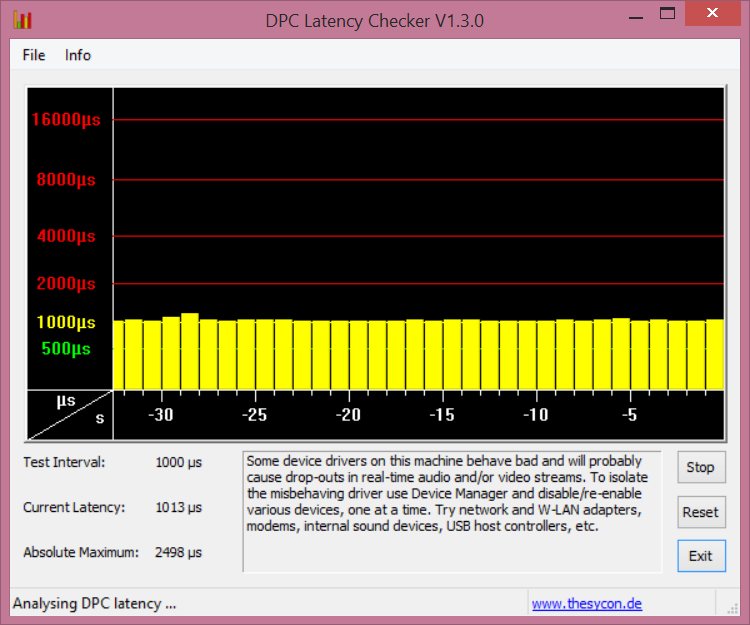 Subjectively, the slow system performance can be felt from day-to-day use. Simple tasks like installing software and launching programs feel sluggish and delayed. Navigating through the heavy UI of Windows 8 is fortunately not bad with little latency and frame skips, but the initial loading and running of applications is certainly anything but instantaneous. 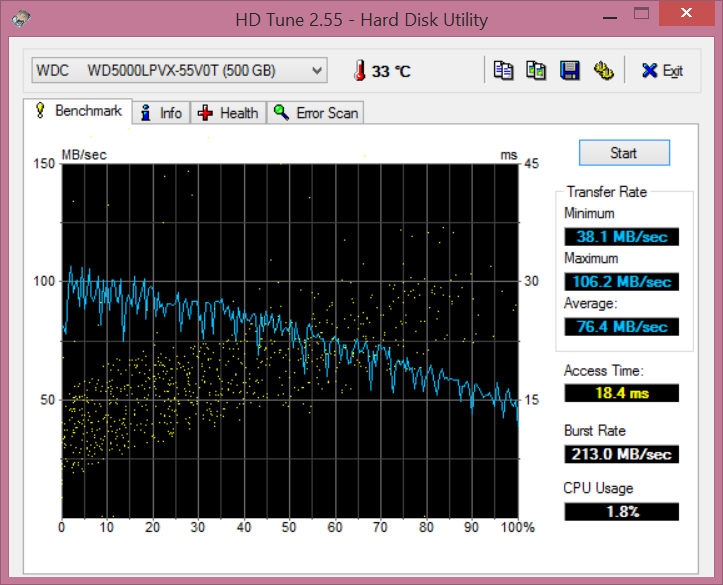 The Flip 14 is equipped with a 500 GB 5400 RPM Western Digital Scorpio Blue HDD. The SATA III 2.5-inch drive is replaceable, but make sure the replacement is 7 mm thick at most. There are no secondary storage options for additional SATA, mSATA, or m.2 drives. 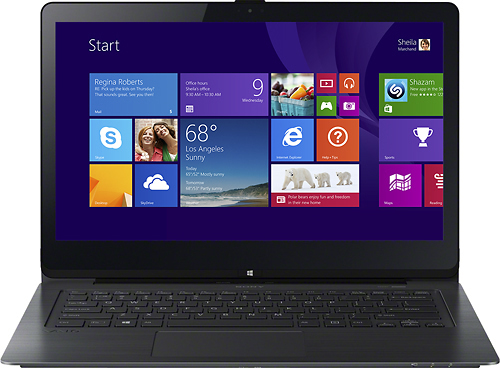 As for performance, the Scorpio Blue line is WD's low-power series for entry-level applications. 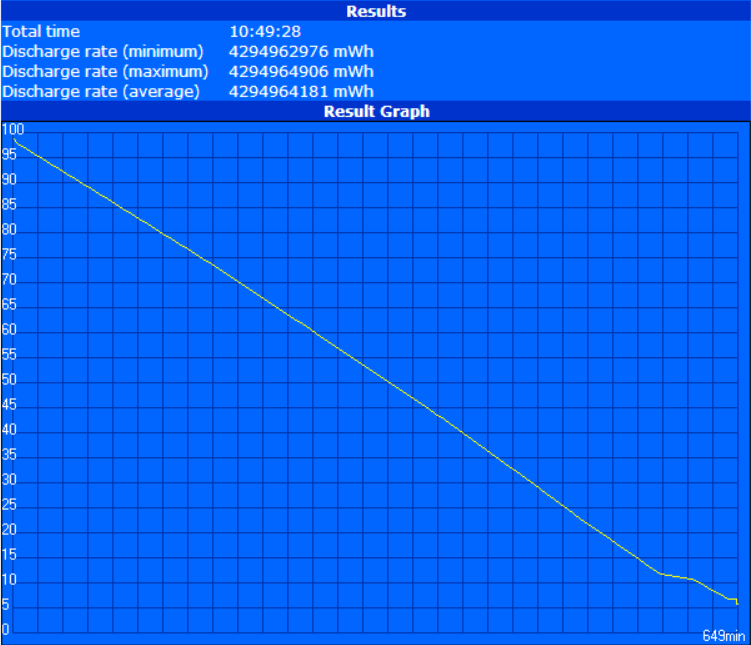 Thus, users shouldn't expect lightning speeds from the default 500 GB drive. HD Tune records an average of 76.4 MB/sec, which is very slow as many 7200 RPM drives average above 90 MB/sec in the same benchmark. 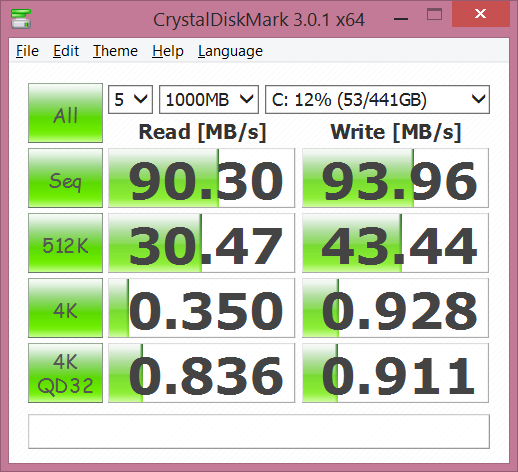 The drive is also no match compared to SSDs of course, which can reach speeds of 500 MB/sec in the CDM sequential read benchmark compared to just 90 MB/sec of the Flip 14. The integrated HD 4400 has been heavily benchmarked and tested in our database, but the Flip 14 is an oddity in the crowd. 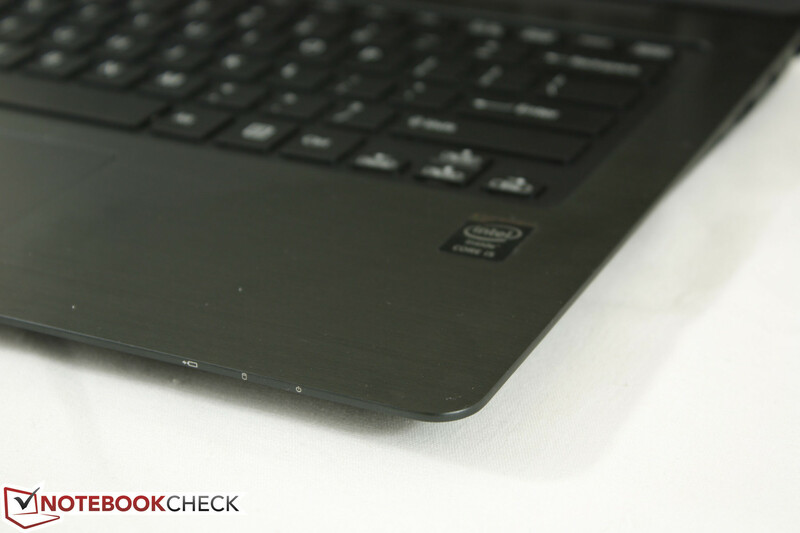 In order to get the numbers as posted in this review, we had to run each test with enough downtime in between for the notebook to cool before starting the next. Otherwise, the scores would have been extremely low due to the heavy GPU throttling as explained in our Stress Test section below. The idling periods between the tests were necessary to reduce the throttling effects on final scores. Even after accounting for the unique throttling situation of the Flip 14, the final scores are nothing to boast about. 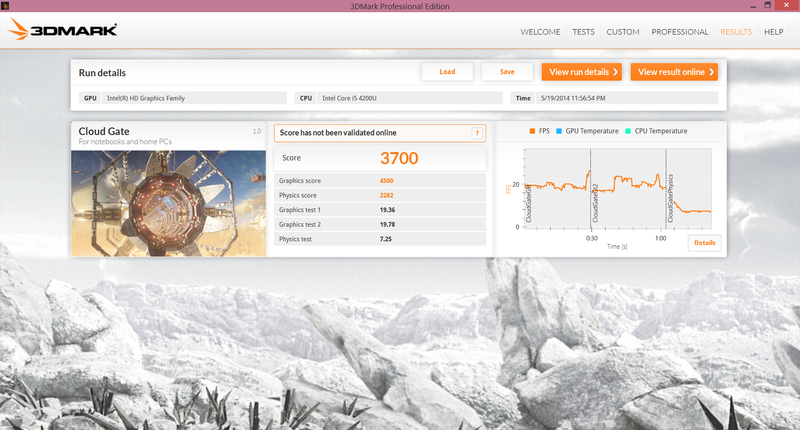 The 3DMark 11 GPU score of 661 points is similar to other notebooks sporting the same i5-4200U CPU like the Latitude E7240 and VivoBook S301LA while its 3DMark 2013 scores are similar to the recently reviewed Toshiba Kirabook. During actual gaming sessions, however, the GPU is too weak for any settings higher than a close minimum - let alone the notebook's native 1080p resolution. More intensive titles like Guild Wars 2 are unplayable no matter the in-game settings. 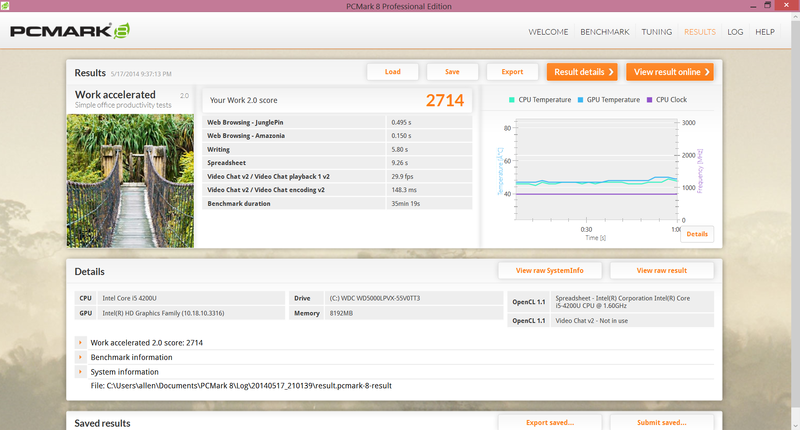 We stress the notebook with Prime95 first to observe any potential CPU throttling. 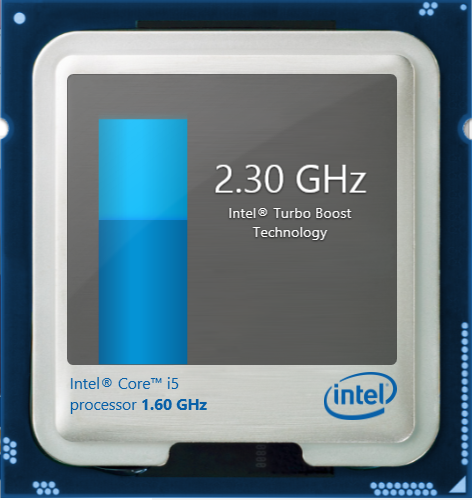 The i5-4200U is able to maintain a 2.0 to 2.2 GHz range, which is only slightly below its rated 2.3 GHz maximum Turbo Boost. The CPU temperature hovers around 70 degrees C under this state. 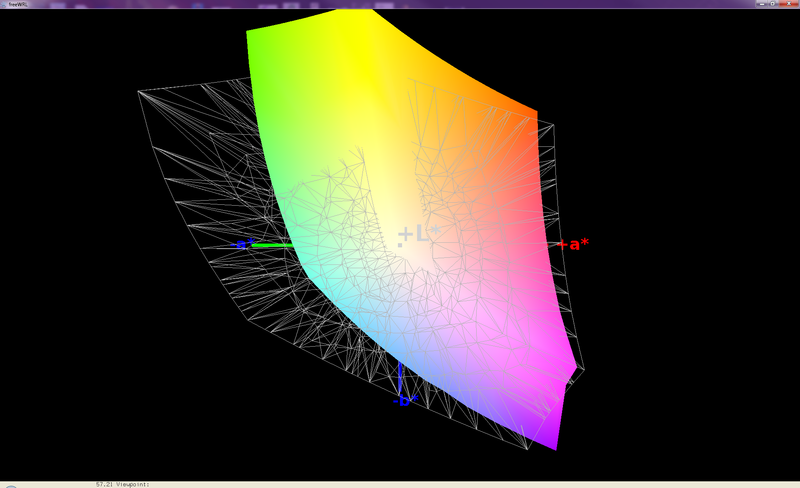 Next, we stress the notebook with FurMark to observe any potential GPU throttling. 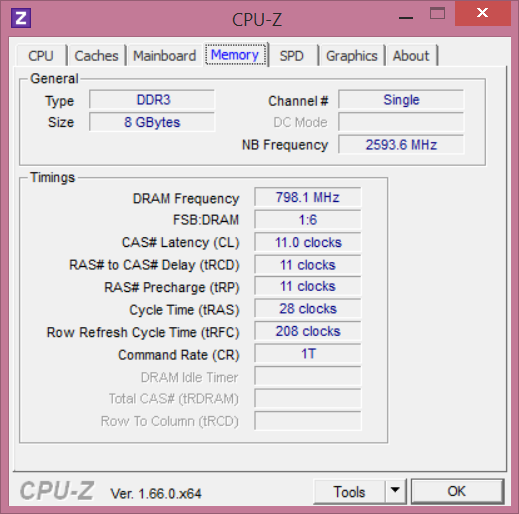 The GPU maxes at 1000 MHz as is normal for an integrated HD 4400 on an ULV Haswell, but this clock speed quickly drops to its base 650 MHz and then even further to 150 MHz in mere seconds. It maintains 150 MHz throughout and never rises despite the high GPU demands of FurMark. 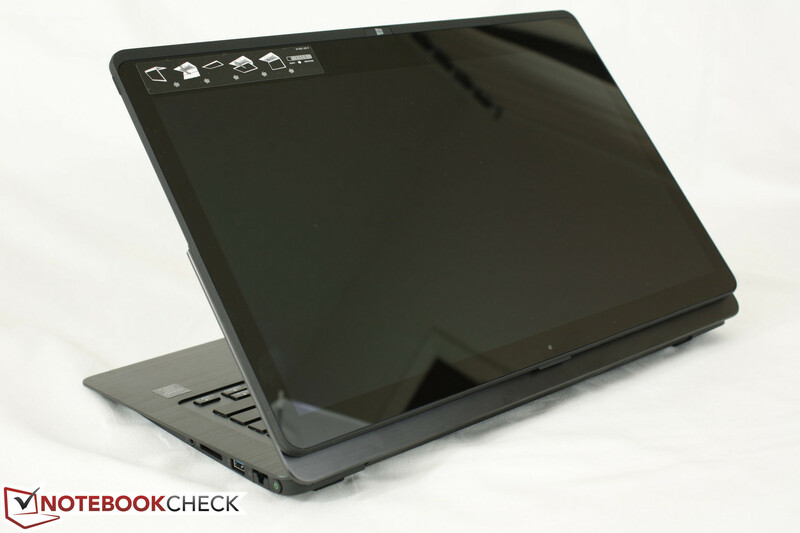 This is extremely disappointing and is unlike other notebooks with the same ULV i5 CPU. 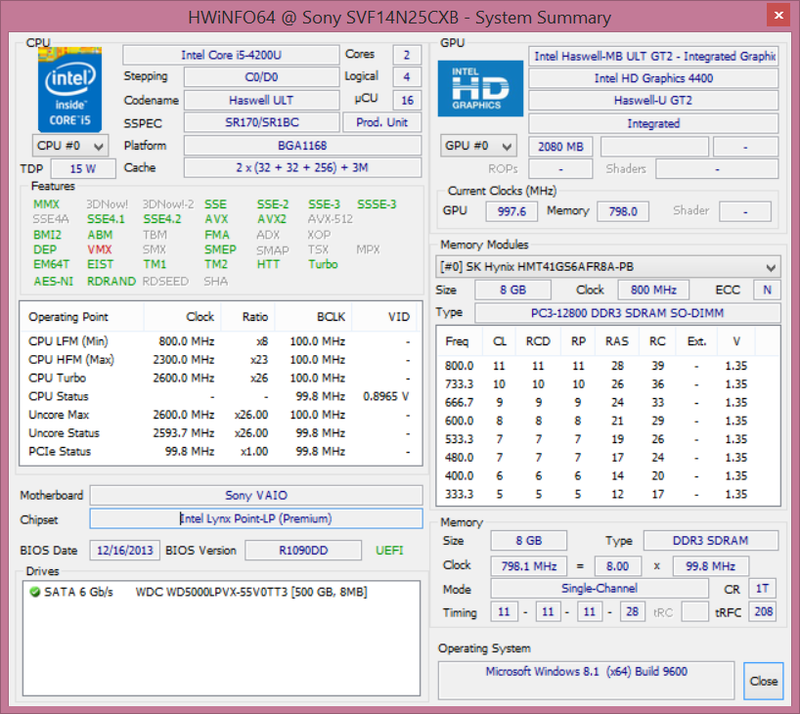 We expected the Vaio to maintain around 650 MHz under stressful conditions as 150 MHz is despicable. 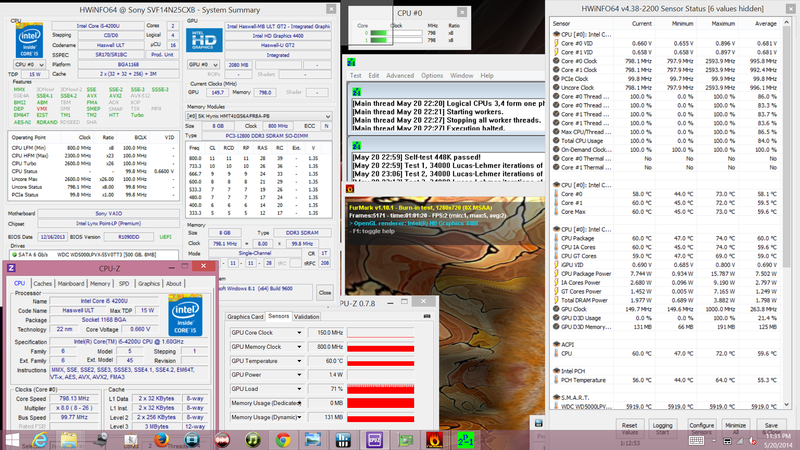 When under both Prime95 and FurMark stress, the Vaio CPU and GPU flatline to 800 MHz and 150 MHz, respectively. 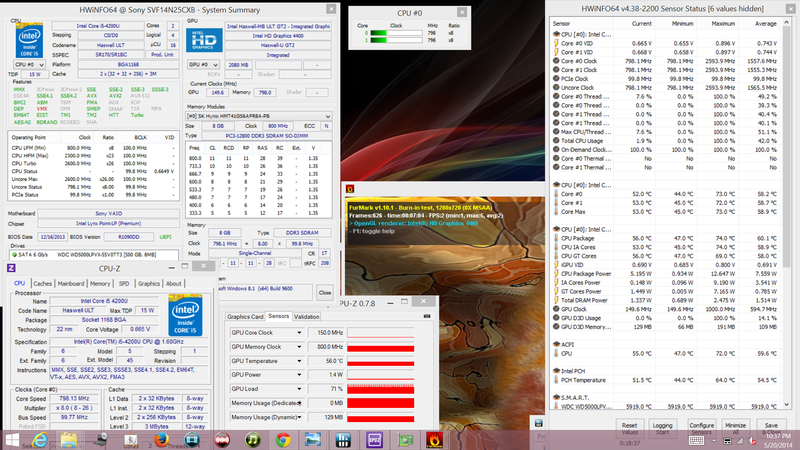 Any Turbo Boost from the CPU is stripped away and the GPU never increases in speed. 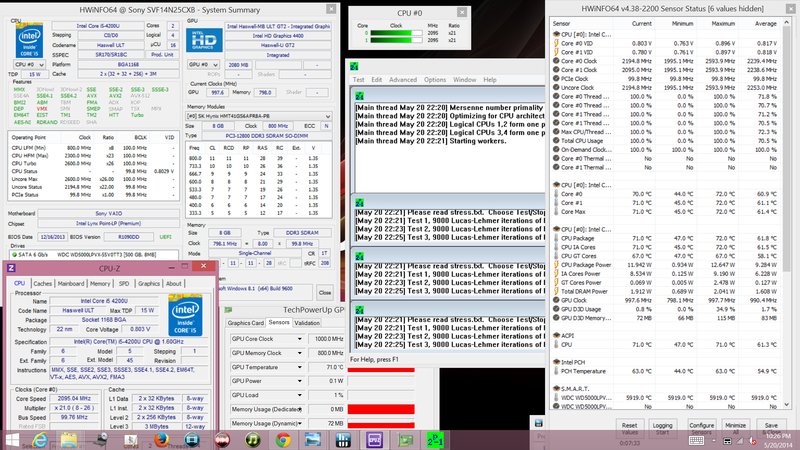 Maximum CPU temperature reaches 60 degrees C according to HWiNFO, even after an hour of full stress. Since this temperature is less than our CPU stress test above, we suspect that the GPU may be limited by a power envelope ceiling or software controller to prevent overheating. 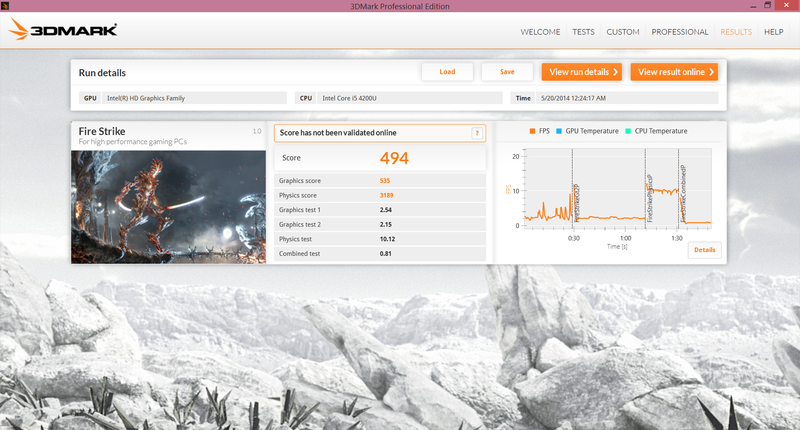 Either way, the extreme GPU throttling is difficult to ignore. 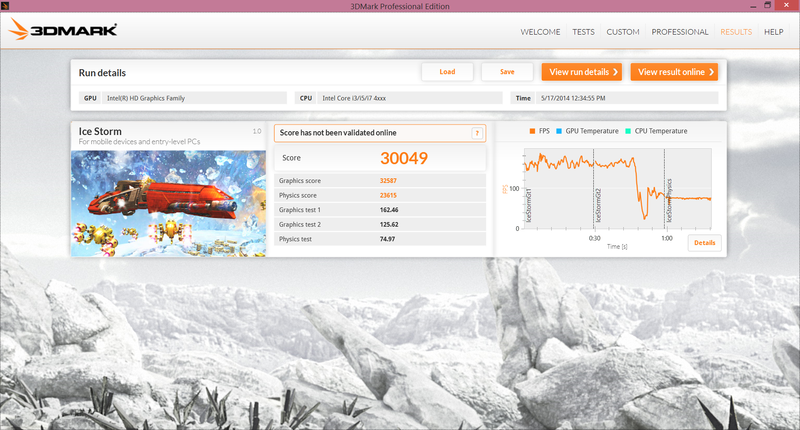 Running GPU benchmarks like 3DMark 2013 sometimes returned unusually low results with final scores of merely 200 or 300 points. 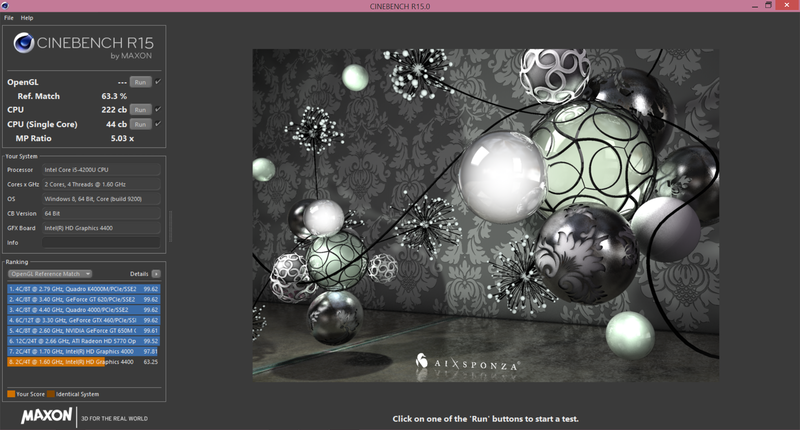 CineBench OpenGL scores were equally low at times as well due to the same GPU throttling phenomenon. This is indeed a large setback for those intending to play the occasional 3D title with the Flip 14. 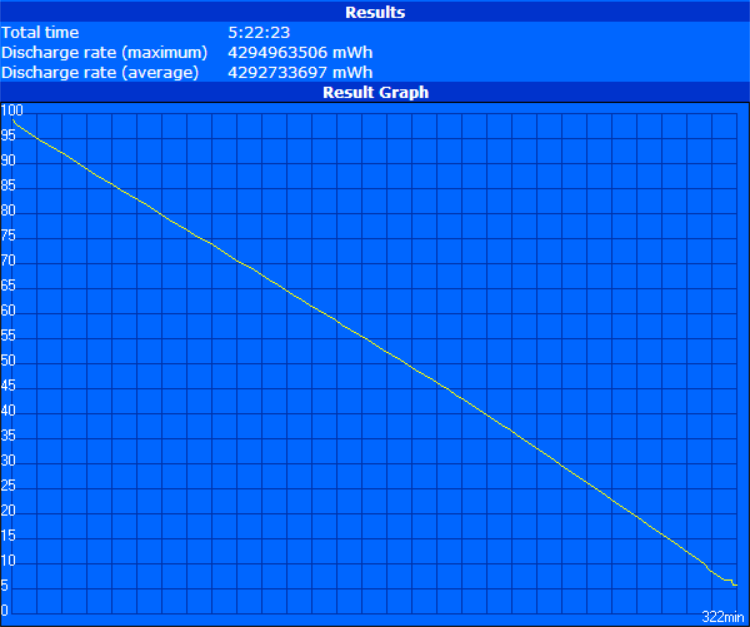 The single system fan is very quiet when the notebook is idle or under low loads. Simply web browsing or word processing will not induce higher fan speeds. This is fortunate, because when the fan ramps up, it really ramps up. Higher loads will bump fan noise from a near-silent 30 dB(A) to 40 dB(A) without hesitation. This is experienced during intensive games and heavy multi-tasking with many active tabs. Sustained maximum load will increase fan noise up to a recorded 48 dB(A), but most users will not likely experience any fan noise close to this maximum under more typical situations. Even so, we would have liked to see another intermediate range around 34 or 35 dB(A) to make the jump to 40 dB(A) a bit less jarring. 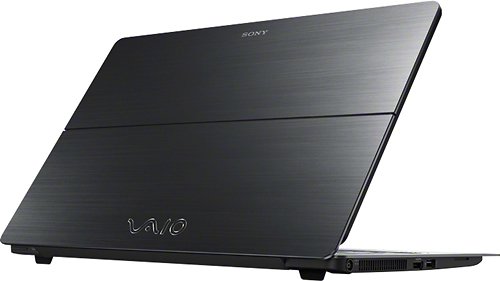 The Vaio may draw attention in quieter environments like libraries or classrooms in this 40 dB(A) sound range. Idling surface temperatures are relatively flat across the board on the keyboard side of the notebook, but the bottom side shows a clear hot spot on the corner closest to the ventilation grilles. This corner is about 5 degrees C warmer than the coolest area of the notebook. In practice, users will not notice the difference if using the notebook on a table. In tablet mode, however, the difference can surely be felt, though the absolute temperature is not nearly hot enough to be a concern. Under high loads for long periods, we were able to measure a maximum of 44.6 degrees C on the same hot spot corner nearest the vent grilles. This is certainly too warm for prolonged skin contact, but it is thankfully very localized and away from the front of the notebook and the keyboard keys. Thus, users should be able to type comfortably no matter the system load. 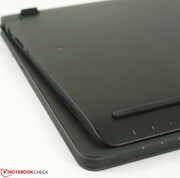 The hot surface can potentially be a problem if using the notebook as a tablet, though again this is very unlikely as most users will not be running intensive applications for long periods in this mode. (+) In idle usage, the average temperature for the upper side is 31 °C / 88 F, compared to the device average of 30.3 °C / 87 F.
(±) The average temperature of the palmrest area of similar devices was 29 °C / 84.2 F (-0.4 °C / -0.7 F). 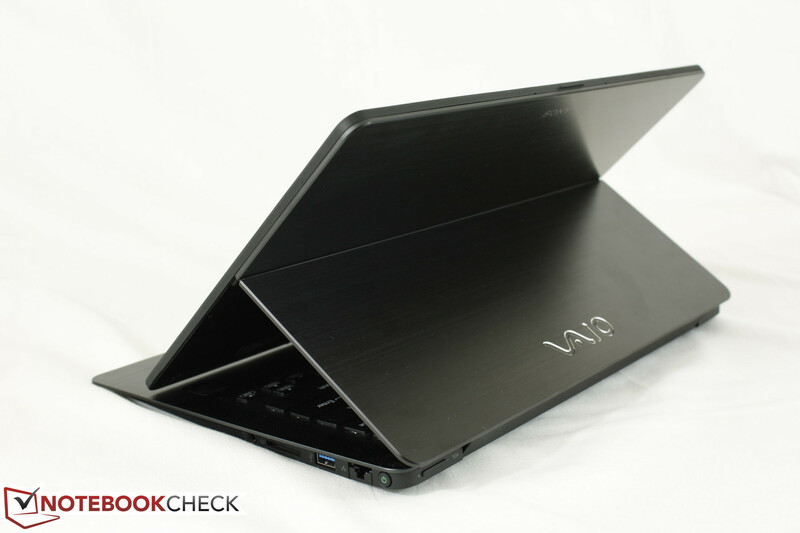 The stereo speakers of the Vaio are positioned on the left and right sides of the notebook behind narrow grilles that can be easily mistaken as card readers. Nonetheless, sound quality is good and feels balanced, which is similar to the Flip 13. Both vibrations and distortions are minimal even at high volumes. Bass is underrepresented as is typical of notebooks this size. For music and videos, the built-in speakers are sufficient if 3.5 mm external solutions are not immediately available. 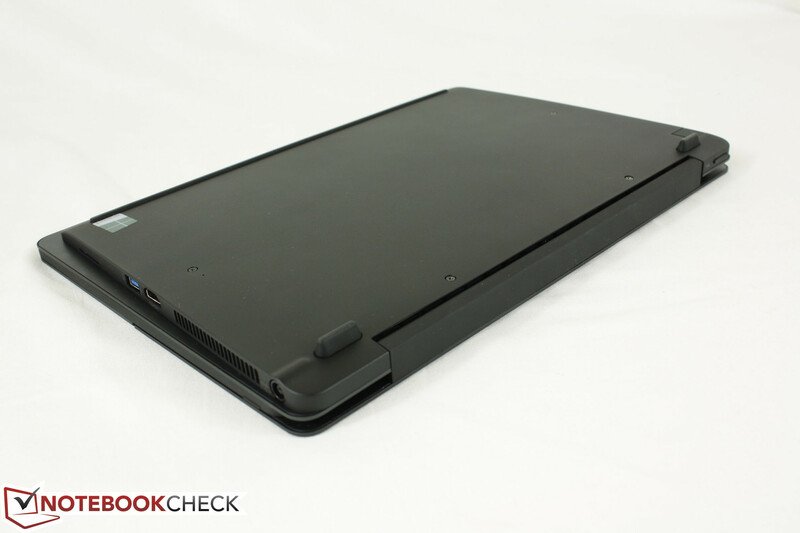 The non-removable 48 Whr battery is standard size for a 14-inch Ultrabook. As such, the average battery of the Flip 14 is similar to many of its closest competitors. 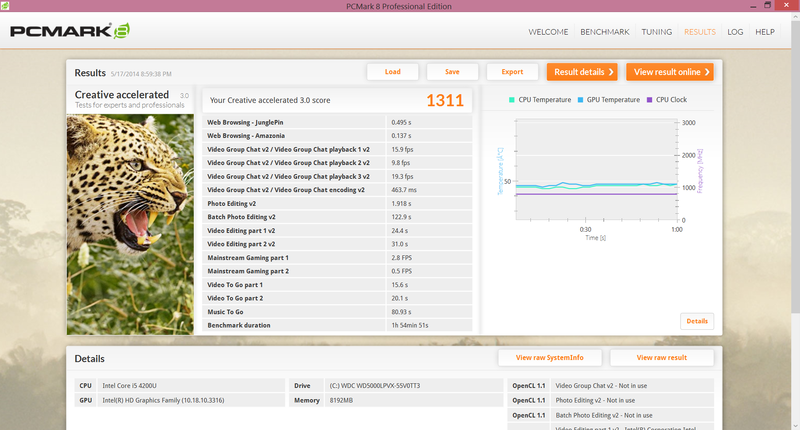 With a WLAN runtime of almost 5 hours and 30 minutes at a brightness setting of 8/10 (about 150 nits), the Flip 14 is on par with the Flex 14 and Transformer Book TX300 while lasting longer than the Taichi 31, Flip 11, and Fit 15 by about an hour under the same testing conditions. 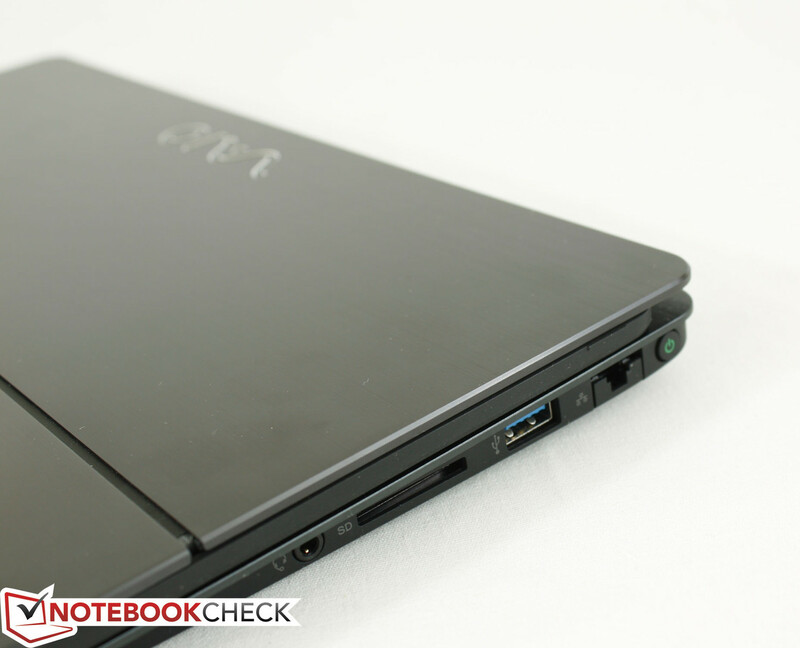 Both the Lifebook T904 and ThinkPad Yoga, however, can last for a few hours longer than the Sony. If used mainly for web browsing and word processing, the Flip 14 should be able to last for a productive day. But, this would be pushing it quite close without the aid of an AC outlet. 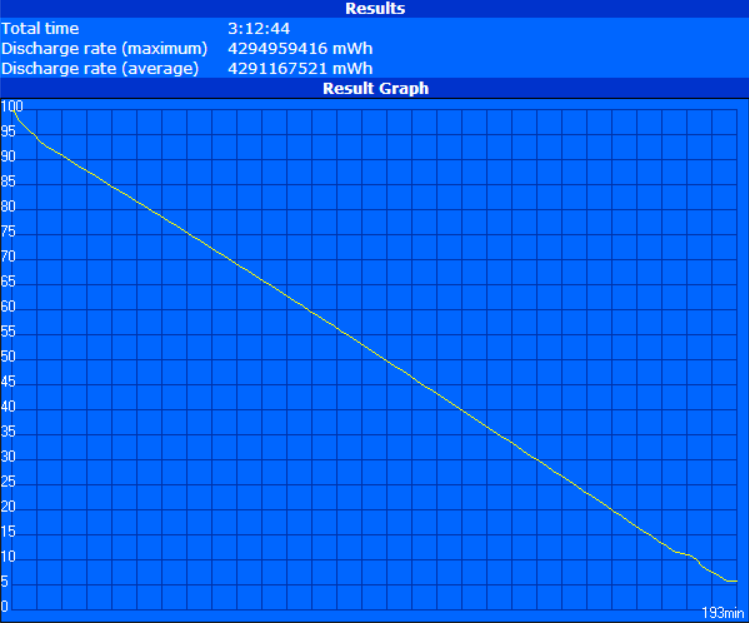 Note the unusually high load runtime of over 3 hours, which is twice as long as most other notebooks under the same testing conditions with the Battery Eater Classic Test at maximum brightness. This may be at least partly explained by the extreme throttling of the CPU and GPU under stressful conditions as detailed in the stress test above. The Flip 14 looks and feels great. The reflective and glossy 1080p screen is beautiful and surprisingly color accurate while the brushed aluminum and rubberized surfaces give it that sleek and expensive feel. We generally enjoy the flip mechanic, too, and its tablet mode is genuinely fun to use during those mellow moments. Instead, the core problems we have with the Vaio lie behind its façade where the issues can be significant enough to thwart us from a full purchase. Firstly, the poor system performance cannot be ignored. 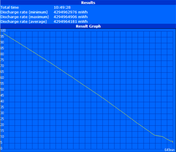 The sluggish 5400 RPM drive makes Windows 8 feel slower than it actually when launching and installing apps. 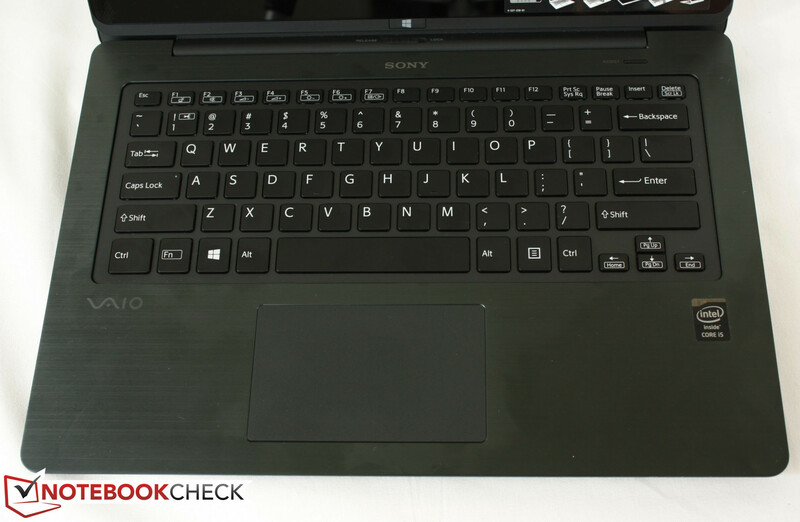 The HDD is thankfully user-replaceable, but it bewilders us why Sony does not offer dedicated SSD solutions especially for a notebook nearing the $1000 price range. Many second generation Ultrabooks even come standard with 128 GB SSDs to avoid the slow performance hiccups of high capacity 5400 RPM mechanical drives that the Flip 14 faces. 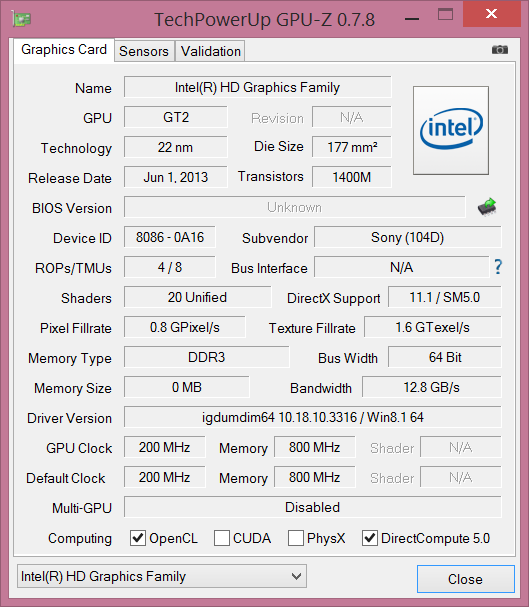 Finally, the GPU throttling of the Vaio is significant and frequent enough to impact games and applications requiring high graphical demands. When combined with other hardware disadvantages like the non-removable battery, single-channel memory, and mushy keyboard, it becomes a bit tough to recommend the $900 Flip 14 over many of its competitors outside of its looks and display. Great design and a bit sturdier than thinner Ultrabooks. 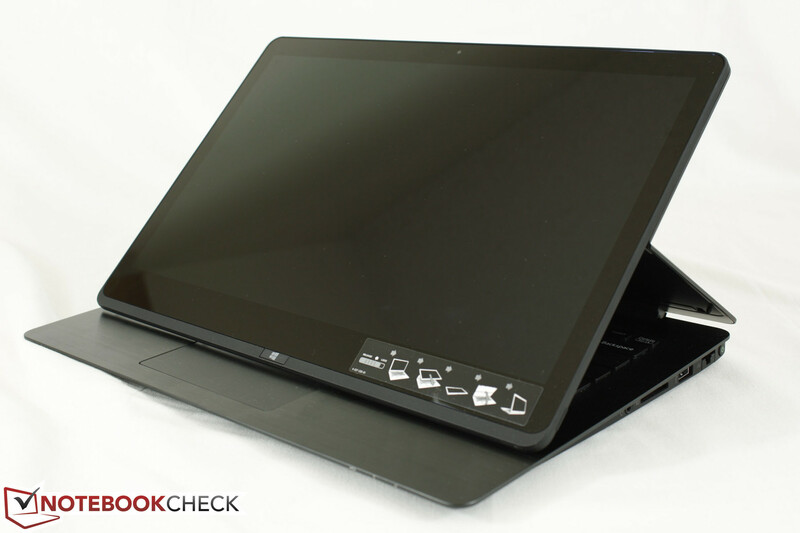 Crisp and bright screen works great in both tablet and notebook modes. Firmer keyboard keys and dual-channel memory. Motherboard accessibility could have been made more user-friendly. 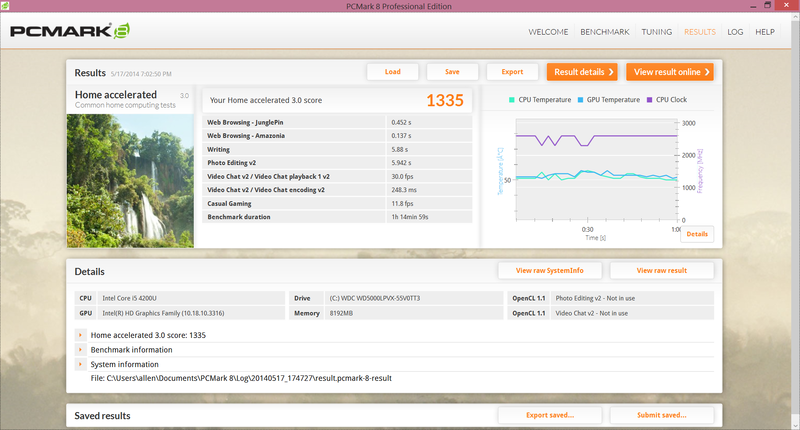 The Flip 14A suffers from CPU and GPU throttling too quickly.